Deanna was born on March 29, 2336, near Lake El'nar on Betazed. She was born to Betazoid Ambassador Lwaxana Troi and Human Starfleet officer Ian Andrew Troi. Deanna was actually the second of their two children, the first being Kestra Troi, born in 2330. However, Kestra drowned when Deanna was an infant. Stricken with grief and regret, Lwaxana removed all evidence of Kestra's existence from her own life and even repressed all memories of Kestra. She also made her husband swear never to mention Kestra again. Because of this, Deanna did not learn of her sister until 2370, when Lwaxana's memories resurfaced. As required by Betazoid custom, Deanna was genetically bonded with a Human male named Wyatt Miller at a young age. Wyatt was the son of Steven and Victoria Miller, close friends of Deanna's parents. Due to their genetic bonding, Deanna was scheduled to marry Wyatt in adulthood. According to her mother, Deanna had a talent for languages as a child. As a child living on Betazed, Deanna learned aspects of Human culture from her Human father, Ian. One such aspect was a fondness for stories set during Earth's Ancient West, which he often read to her. To fall asleep, she would ask him to sing the American song "Down in the Valley"; while this was her favorite, it was his singing that made her feel safe. As she was half-Human and half-Betazoid, she never felt trapped between the two worlds to which she belonged, instead choosing to embrace the richness of her dual heritage. She also heard stories from her maternal grandfather, who told them telepathically; something of a traditionalist, he rarely spoke, saying speech was for "offworlders and people who didn't know any better." Deanna's father died in 2343, when Deanna was only seven years old. Even so, she remembered him fondly, and when she became pregnant by an alien energy being in 2365, she named the child after her father. Deanna began studying psychology sometime in the 2350s. She attended the University of Betazed, where she studied psychology. During her time at the university, one of her patients was Tam Elbrun, a Betazoid male who had been suffering from mental instability due to his lack of the Betazoid's natural ability to "tune out" the thoughts of others. 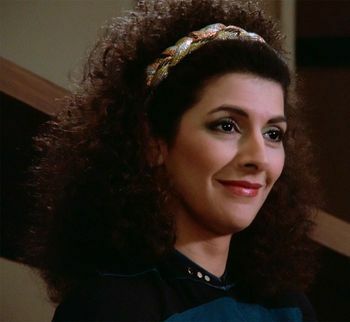 Deanna Troi entered Starfleet Academy in 2355. She graduated in 2359, majoring in psychology. On her homeworld of Betazed, she met William T. Riker, a Starfleet lieutenant who was stationed on the planet. The two began a relationship sometime between 2357 and 2361, and the relationship lasted several years. After Riker was assigned to the USS Potemkin, the two planned to spend their holidays together on Risa in 2361. However, Will had to cancel their plans after he was quickly promoted to lieutenant commander – deciding to make his career his top priority, Will stopped pursuing Deanna, and the couple eventually lost contact with each other. In 2363, Admiral J.P. Hanson assigned Troi to the staff of Captain Jean-Luc Picard, ostensibly as a first contact specialist. Her actual role, however, was to judge the captain's mental state. Deanna immediately told the captain the truth, as she felt it would be unethical to do otherwise. She remained on his staff as both contact specialist and counselor, and aided him in dealing with his emotions concerning the Manraloth. In late 2363, Troi was promoted to lieutenant commander. While on Vulcan during a lay over on her way to Earth for the launch of the Enterprise-D, she counseled Picard (who was on Starbase 52) when he discovered that Beverly Crusher had been assigned as Enterprise chief medical officer. Picard later surprised her when he told her he'd found his new first officer, William Riker. Troi proved herself to be an important asset to the crew of the Enterprise-D during the ship's first mission to Farpoint Station in 2364. Her ability to sense feelings and emotions yielded vital clues which allowed the crew to determine that the station was actually a shapeshifting spaceborne entity being forced into servitude by the Bandi. By rescuing the creature and reuniting it with its mate, Troi and her shipmates managed to pass a test of Humanity's intentions imposed on them by Q. Soon after, Troi was affected by polywater intoxication that caused her and the majority of the Enterprise's crew to act out of character, but she was quickly taken to sickbay and provided with medical treatment. Her empathic abilities were also useful a short time later, when she assisted in uncovering the intentions of Ligonian leader Lutan after he kidnapped security chief Natasha Yar. Later that year, the Enterprise traveled to Haven, a legendarily beautiful planet near Beta Cassius. The planet was also the location of Wyatt Miller, who was scheduled to marry Troi as a result of their genetic bonding. Having expected that the marriage would not take place due to the years-long distance from her homeworld that serving aboard the Enterprise would cause, Deanna initially did not inform her crewmates of her obligation. Nevertheless, she agreed to honor her vows taken years earlier, even though she had since become doubtful of them and would need to leave the ship with her new husband once they had been married. While Deanna's mother, Lwaxana, and both Wyatt Miller's parents were aboard the Enterprise, a social gathering known as a pre-joining announcement was held to celebrate the forthcoming wedding. The marriage itself was permanently canceled, however, when Wyatt, a doctor by profession, chose to join his fantasy lover (a real woman he had had frequent dreams about) aboard an infected Tarellian vessel. Along with everyone else on the Enterprise-D was transported to a different quantum reality and the year 2379.